october is my month for the kc scrappy bee! super excited, but i had a hard time choosing what i'd like everyone to make. i sort of realized this morning i needed to have them ready by tonight! we're all going to be at denyse schmidt's program, so what better time to bust out my chicopee charm packs? and look, won't it be awesome! i decided on a variation of the mosaic block from the summer sampler series. i still want to make the whole quilt someday! i have 2 charm packs of chicopee, so that's what we're using, along with white. the chicopee charms are 6 inch squares, which means they make 5 1/2" hst. the pinked edges are a bit shy of 6", so i centered them on the white. draw a line corner to corner, then stitch along each side. cut apart, and square them up to 5 1/2". you won't have much to cut off, if any. This is the block you're making! I like your alternate block ideas - i used this block for a bee but didn't think about changing the settings. Love the block and thanks for the tutorial. 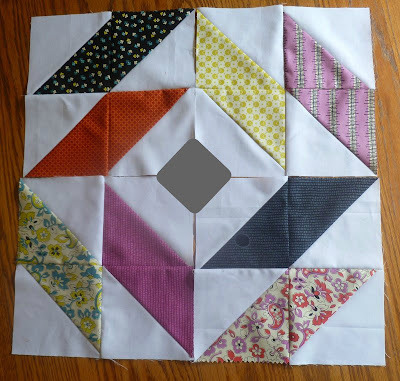 I am so going to make this block tomorrow. Love the fabric! I'm assuming you draw a line down the diagonal center and sew on either side to get two hst's. Is that right?